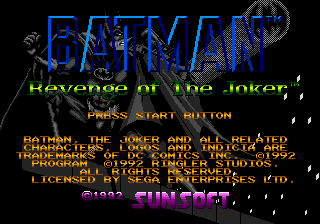 Batman: Revenge of The Joker is a Batman game developed by Ringler Studios and published by Sunsoft for the Sega Mega Drive. It was released on the NES and Game Boy as Batman: Return of The Joker. Despite being published by Sunsoft, it is not a sequel to their earlier Mega Drive game Batman, but is instead an entirely new game based on the comic books. This version of Revenge of The Joker was only released in the US. While from a gameplay standpoint, all versions of Batman: Revenge of The Joker (or Return of the Joker) are broadly the same, few of the art assets were shared between ports, meaning the Mega Drive Revenge of The Joker has an aesthetic unique to the system. Backgrounds are generally darker than their counterparts on the Super NES, but colours are more vibrant. Level layouts are structured similarly, but the precise positioning of platforms again differs between the two versions, sometimes to the benefit of the Mega Drive game, and other times to the Super NES. The Mega Drive version usually has more detailed backgrounds, but the SNES has a more explanatory HUD. Against Batman: Return of The Joker, the Mega Drive version is the more accurate of the two 16-bit ports, however the brighter and more colourful aesthetic creates a very different tone from the 8-bit version. Main article: Batman: Revenge of The Joker/Magazine articles.